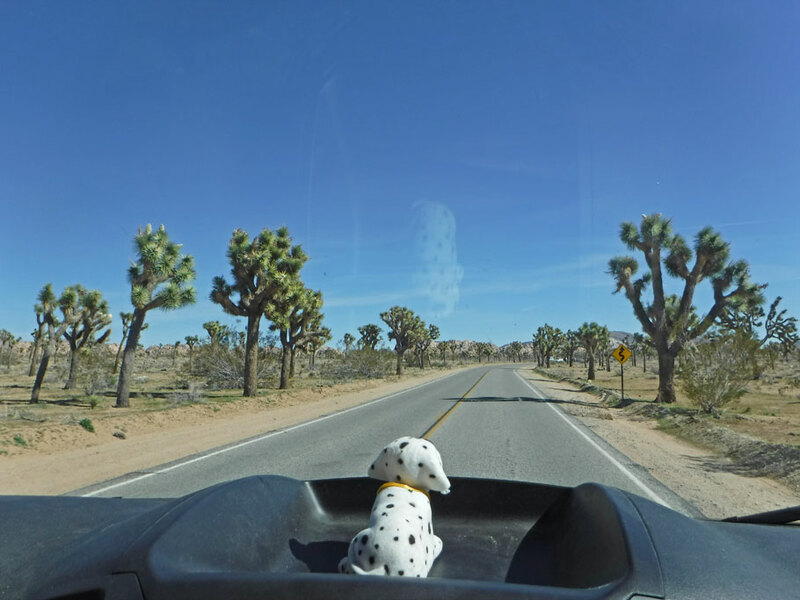 Bob enjoys a ride through Joshua Tree National Park. March 9 – 12, 2017. Many, many, many moons ago, in August 1934, it was crunch time for Minerva. She had already accomplished a lot, but this was important. And Harold had to understand how important. 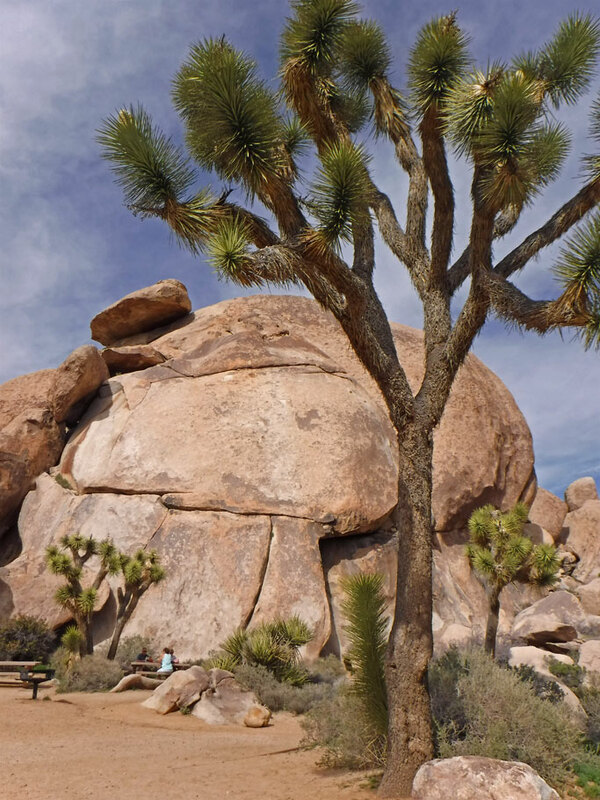 A few months earlier she had failed to convince the National Park Service to obtain the acreage needed to create a Joshua Tree preserve. Back then she had tried to sway Yellowstone’s superintendent Roger Toll. He traveled each winter to evaluate potential parks. He rejected most candidates, and found her proposed site “lacking in any distinctive, superlative, outstanding feature that would give it sufficient importance”. He was highly respected, and his opinion carried weight. But she felt strongly about this. She called in favors and lobbied for another chance. 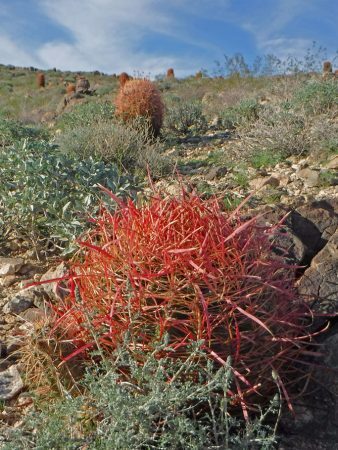 Inundated with letters from congressmen, businessmen, scientists and garden club members, the park service was sending Head of Research, Harold Bryant, to do another survey. Maybe he could be convinced. 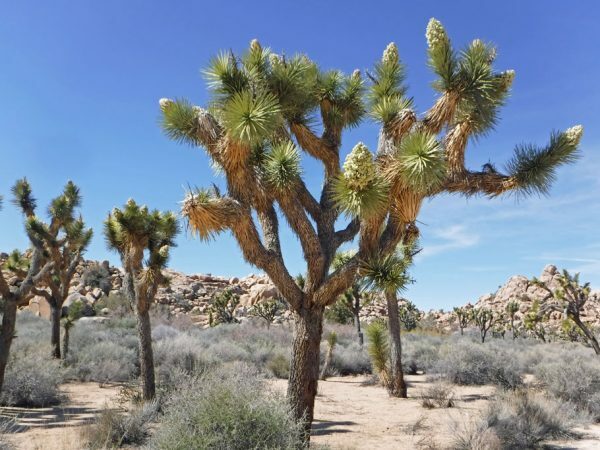 He was persuaded, of course, and now we can all visit Joshua Tree National Park. It’s easy today to assume that people always thought national treasures like this should be protected. But without the fighting spirits of people like Minerva Hamilton Hoyt we might have no parks to appreciate. Married Dr. Albert Hoyt from NY, and moved to Pasedena, CA. Became a socialite, presiding over Boy’s and Girl’s Clubs and Philharmonic. In 1918-19 lost her infant son, husband, and father. Spent much of 1920s exploring desert lands and learning about desert wildlife. During this time cacti in nearby Devil’s Garden were pirated for people’s yards, leaving the area bare. Joshua Tree cacti were used for lumber, and set on fire for fun. In 1928 flew cacti to exhibits in Garden Club of America in NY, and also to England. 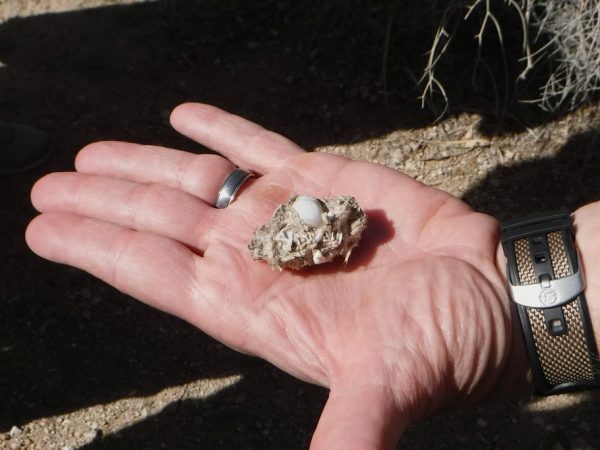 Successfully lobbied for land preservation in Anzo-Borrego and Death Valley. In 1930 founded International Desert Conservation League. In 1931 got Mexico’s President Rubio to establish desert park near Tehuacan. He dubbed her “Apostle of the Cacti”. Highly instrumental in getting nearly one million acres preserved for Joshua Tree in 1936. As Superintendent of Yellowstone (1929-36) established a winter base office in Denver, CO. From there visited and evaluated 129 candidate sites for NPS. In Jan 1934 toured Big Bend in TX, recommending it become a park. In March visited Joshua Tree. In Feb 1936 visited Big Bend again to explore joint efforts with Mexico. Killed in an auto accident on his return trip to Denver. 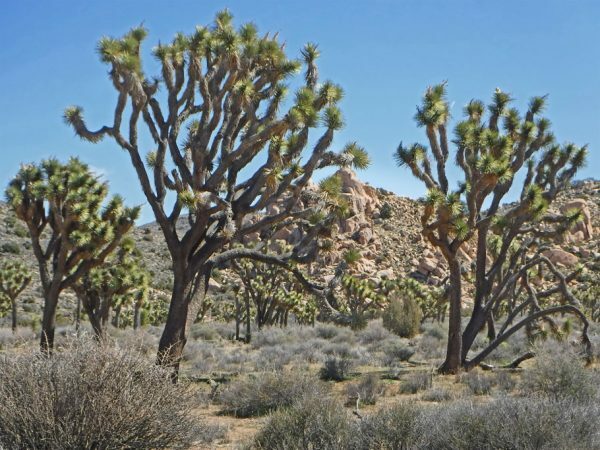 Was convinced in 1934 visit that a large park was needed for Joshua Tree cacti. Had a distinguished career with the Park Service. But was proudest of his efforts to establish ranger-led outdoor activities. 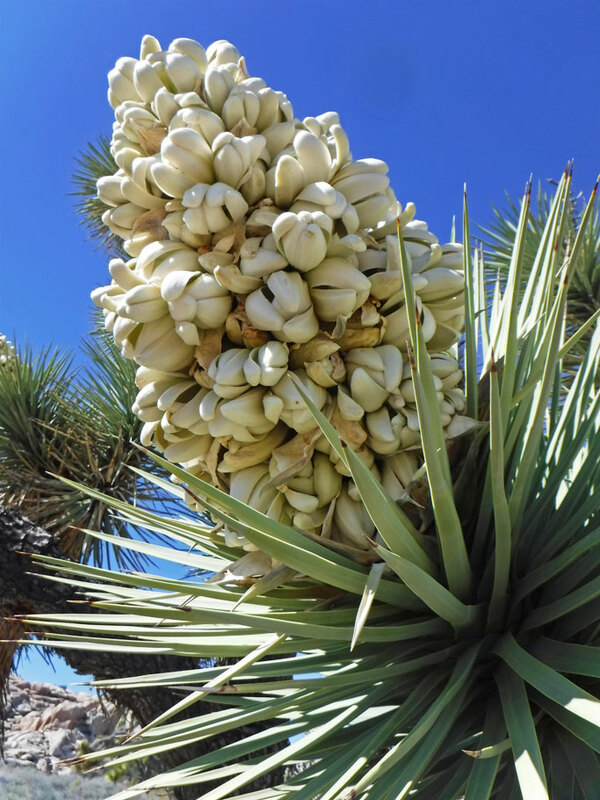 Click here to visit the National Parks Service website for everything you need to know about visiting Joshua Tree. 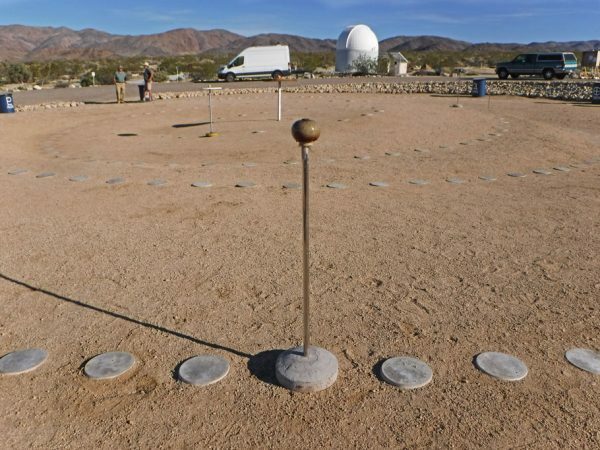 Click here for info about visiting the orrery just outside of Joshua Tree at Sky’s the Limit Observatory and Nature Center in Twentynine Palms. And finally click here for a map of the area. 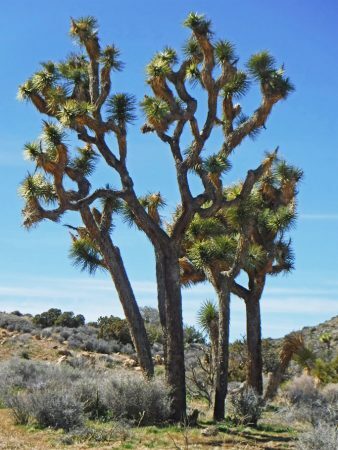 It’s said that the Mormons called these Joshua Trees because they were reminded of Joshua raising his hands in the air to pray. If pressed into naming them for a biblical character I think I would have chosen the crazy acting prophet Ezekiel, or maybe the demon-possessed Legion. Not really a tree and not a cactus, this is Yucca Brevifolia. Here is a cross section of the trunk of a Joshua Tree. Early settlers appreciated its woodlike qualities. 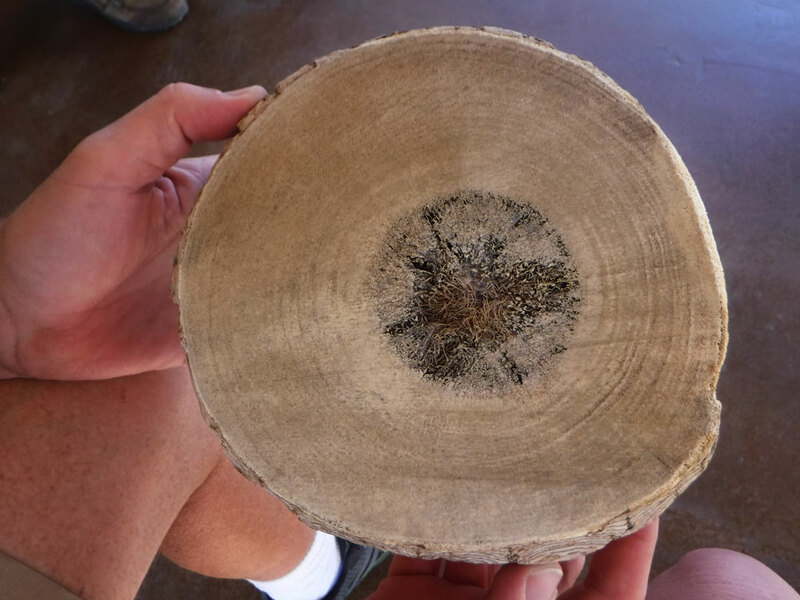 Like a tree it has growth rings, but each ring does not represent a year. A Joshua’s age is difficult to determine. An average lifespan may be 150 years. The Joshua Tree can be a haven for birds, small mammals, and reptiles. At the Twentynine Palms visitor center an owl regularly perches in a Joshua waiting for mice to come by. Here are the remains of one of its unlucky victims. The owl consumed this mouse whole, and pooped out a pellet containing the bones it couldn’t digest. 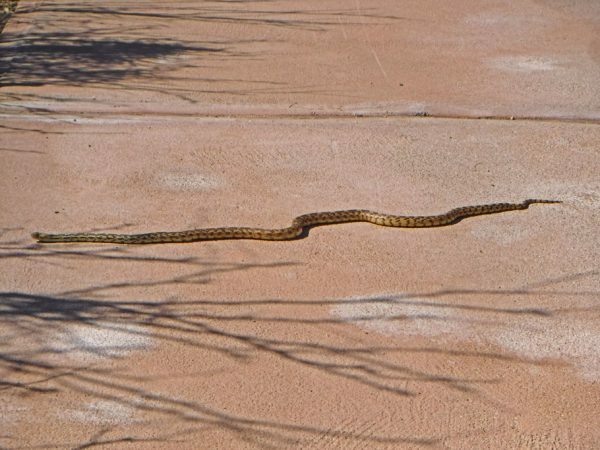 Owls aren’t the only things that the rodents need to watch out for. Here in the Mojave Desert the hunting is generally done at night. During the day most anything that moves is hiding from the sun. Scientists estimate that the little blue rock we live on is 4 billion years old. In that time the cooled lava, ocean sediment, and pressurized stone that form her skin have shifted around. These rocks, which were once on the coastline of Pangea, are celebrating their 1.7 billionth (or so) birthday. Millions of years ago this seaside sediment was forced underground, where pressure turned it into monzogranite. Later, as it was lifted (in a much wetter climate) erosion created fissures. In the foreground is a fissure that was filled by quartz. The rounded monzogranite formations or “islands in the desert” are called inselbergs by geologists. Panoramic view from inside Hidden Valley. Almost fully enclosed, there is a narrow entrance, said to be blown open in 1936 by Bill Keyes. More of Hidden Valley. Legend says that cattle rustlers stored their herds here. From the ground it’s difficult to get a good picture of precariously balanced Cap Rock (upper left). Singer/songwriter/musician Gram Parsons loved this spot. After his death a couple of his inebriated compadres hijacked his embalmed corpse, brought it here, poured five gallons of gas into the coffin and set it on fire. The cremation effort was not a complete success. A good deal of Gram’s remains are now buried in New Orleans. Keys View in Joshua Tree National Park. We’re looking out at the Colorado Desert as it descends to elevations below sea level. Behind us is the Mojave Desert. Joshua trees are found in the Mojave’s higher elevations. 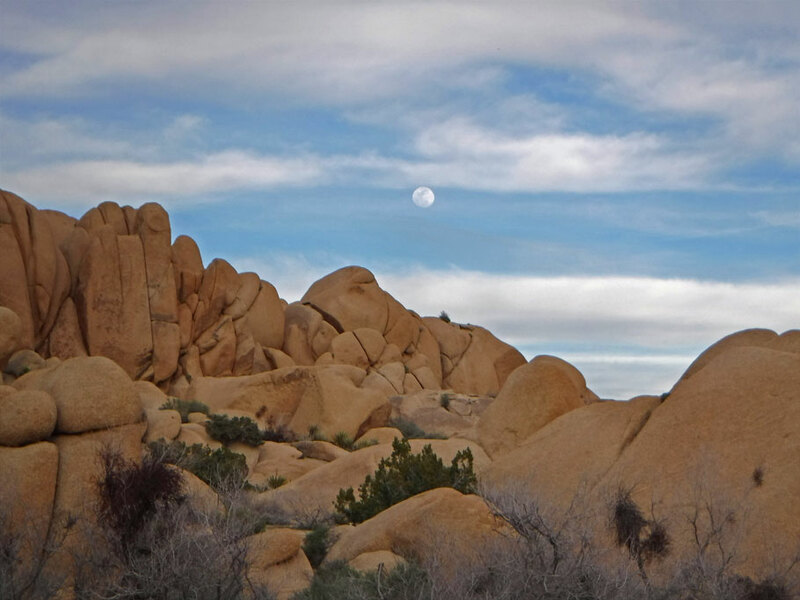 Moonrise over the Jumbo Rocks campground. 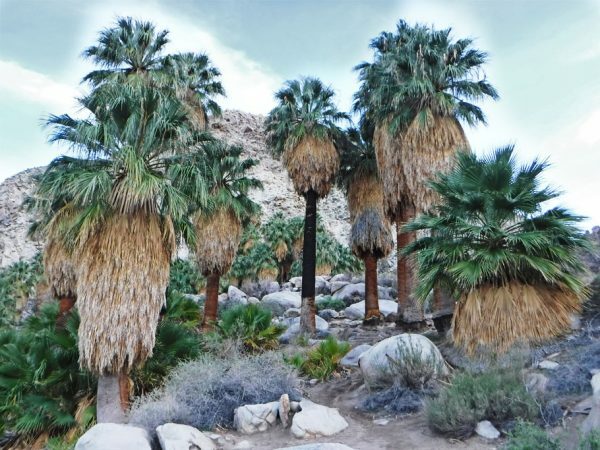 On the northern end of the park is the 49 Palms trail. A hike of almost two miles brings you to this view of the oasis. 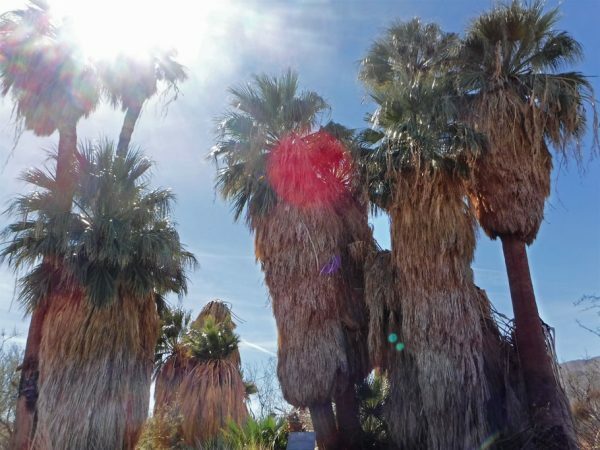 Here’s a closer view of the palm trees. This oasis has been visited by humans for thousands of years. 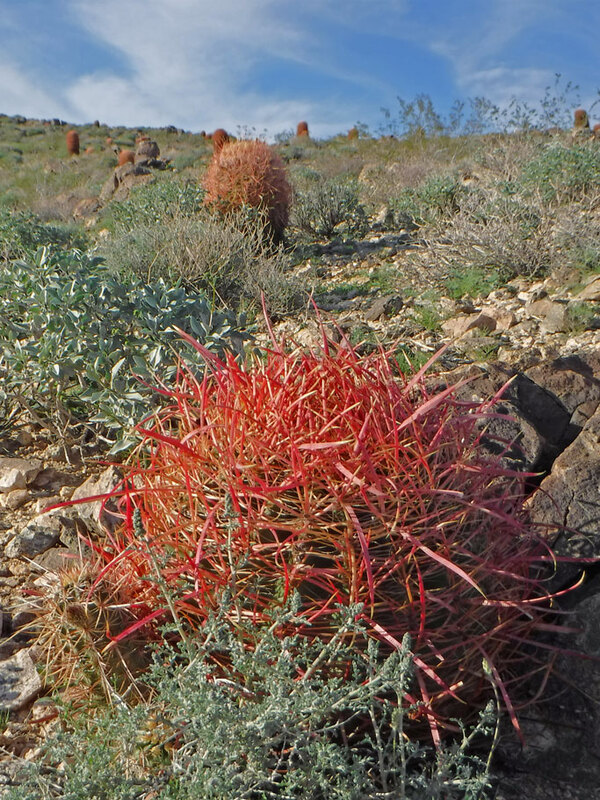 Red cacti on the trail to 49 Palms oasis. At 49 Palms near dusk the air gets noticeably cooler. 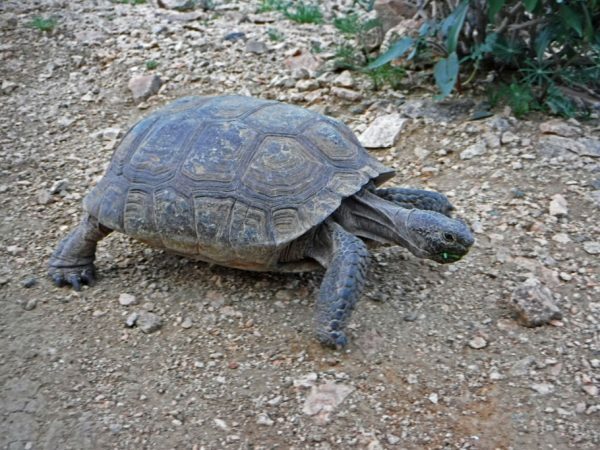 This tortoise comes out to chomp on some greenery. 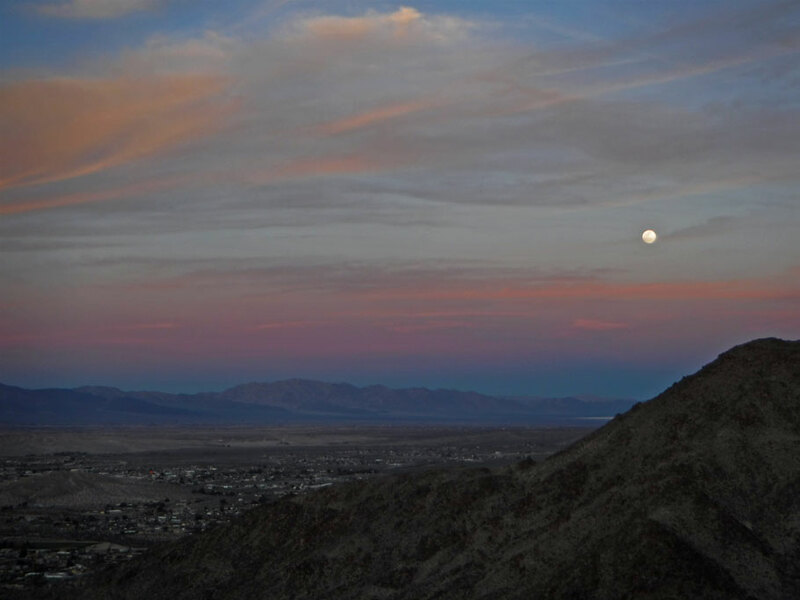 Moonrise as we return from 49 Palms. In the distance, past the town, is an Army base. We’re told it’s a complete house by house reconstruction of Baghdad. It was used for training maneuvers during the Iraq conflicts. 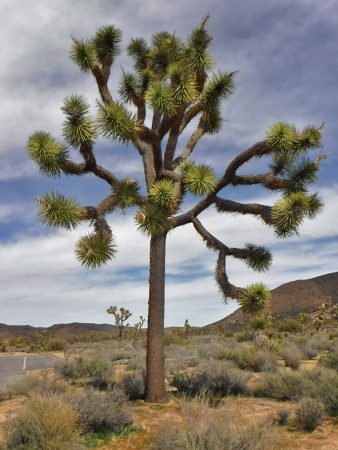 Each branch of a Joshua Tree grows in a straight line until it experiences some kind of trauma. Then the growth changes direction. Apparently the desert is not a kind environment. 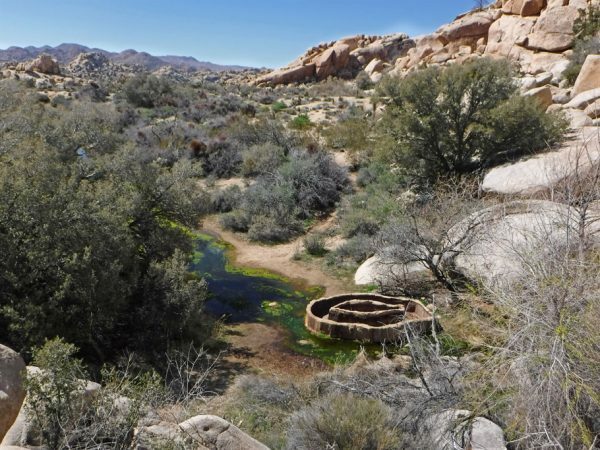 Built in 1900, with help from cattleman CO Barker, the Barker dam brings a pool of open water to this arid desert. Old watering hole for cattle near the Barker Dam. 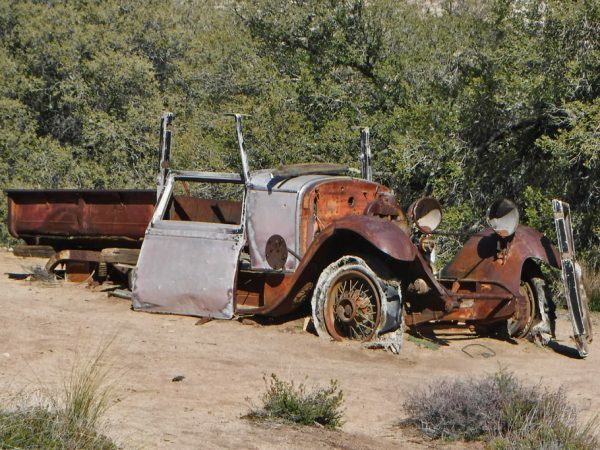 Here at the Wall Street Mill we see that some man-made items just won’t disappear from the desert. The park has been a place of inspiration for artists like Keith Richards, Eric Burdon and the band U2. But you needn’t be an artist to draw inspiration. Two Joshua Tree National Park marks where two deserts meet: the Colorado and the Mojave. 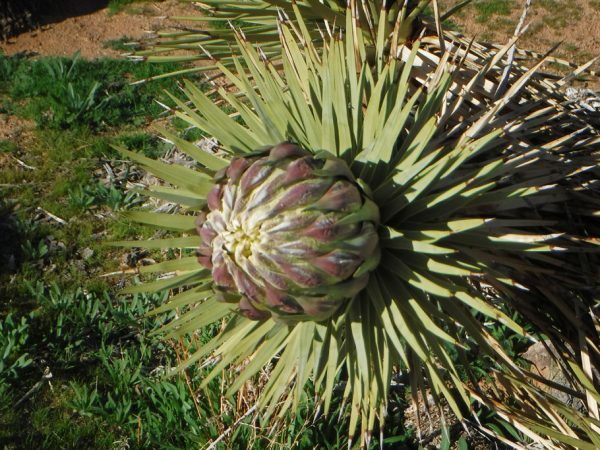 The Colorado averages 2-3 inches of annual rainfall, and the Mojave gets 5 inches. The Joshuas need that extra little bit of water. Here, northwest of the Hexie mountains, they thrive. They are not found in the southern side of the park. 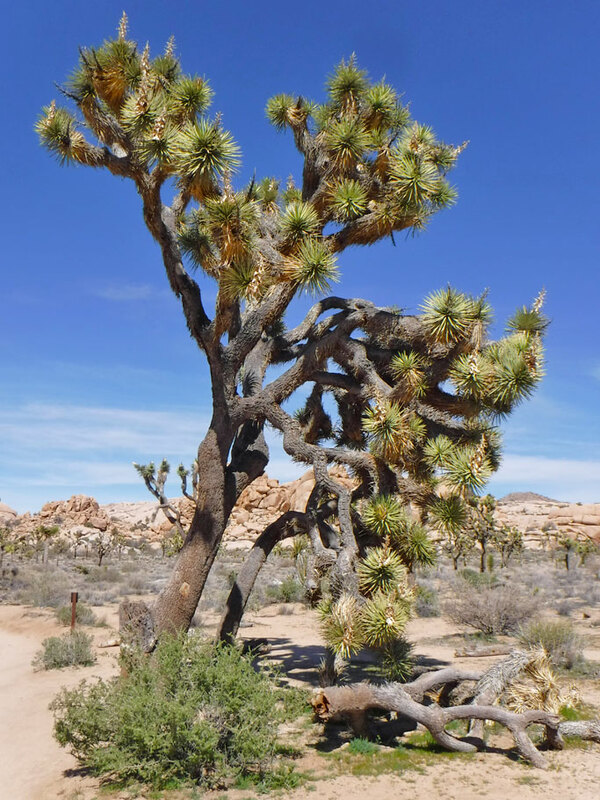 This Joshua Tree leans over the predecessor that probably gave it the shade it needed to survive to adulthood. The bloom is underway. Very few of the numerous seeds will survive to become adults. Even the little guys raise their arms to the skies. Surprise! Just outside of the park we saw this orrery. 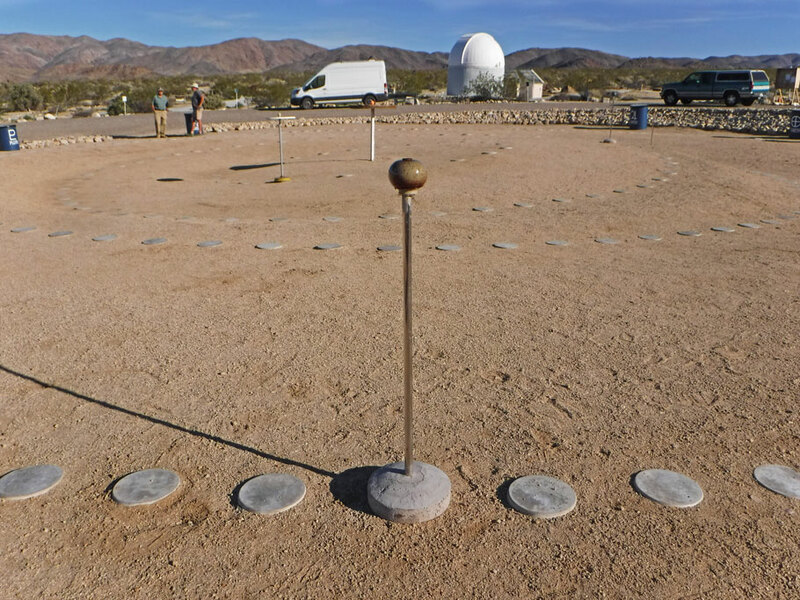 The orbits of Mercury, Venus, Earth, and Mars can be captured in this picture of the scale model. But you must travel a bit to see the orbits of the outer planets. 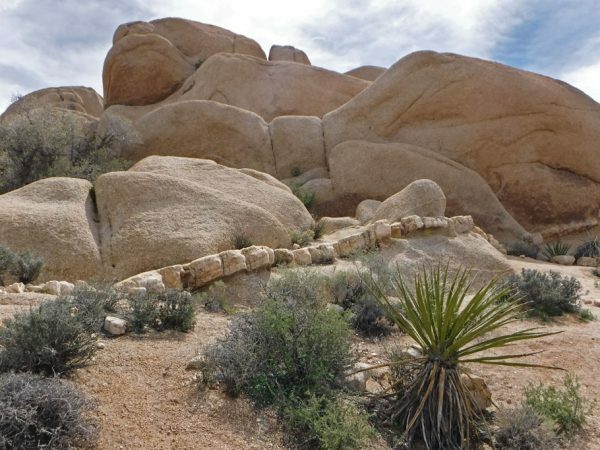 This entry was posted in California, Travel On The Dirt and tagged California, desert, Joshua Tree, Joshua Tree National Park, Joshua Trees, National Park, NPS. Bookmark the permalink. Yay for Minerva! I really enjoyed our time at Joshua Tree, especially the walk inside the Hidden Valley. Very cool place. Yes, Minerva is so cool! We are going to go find the land she saved in Mexico too. Joshua Tree is pretty special. 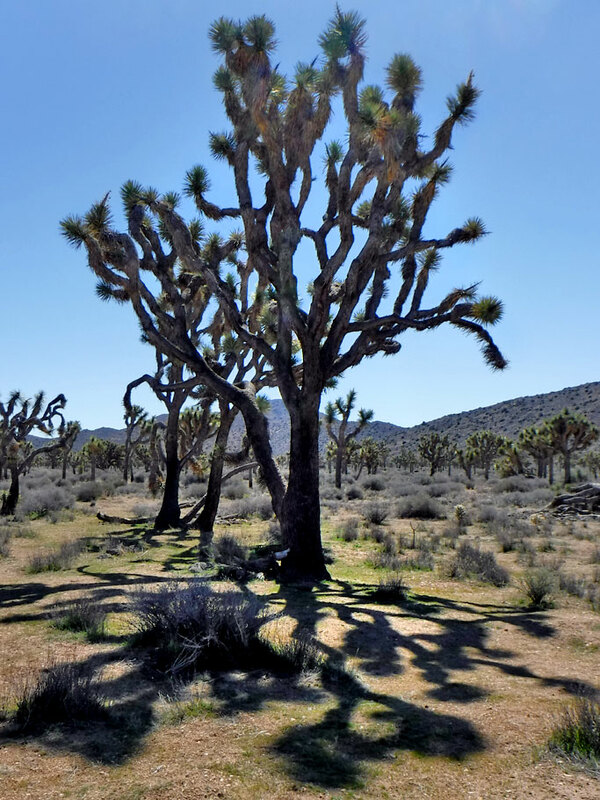 Many years ago I passed through Joshua Tree National Park. At least a sign told me I was in the park, but nothing like trees yet. A couple mile on there was one tree by the side of the road and a lone sign saying “Joshua Tree” with an arrow pointing at the tree. It was hilarious! Funny story! 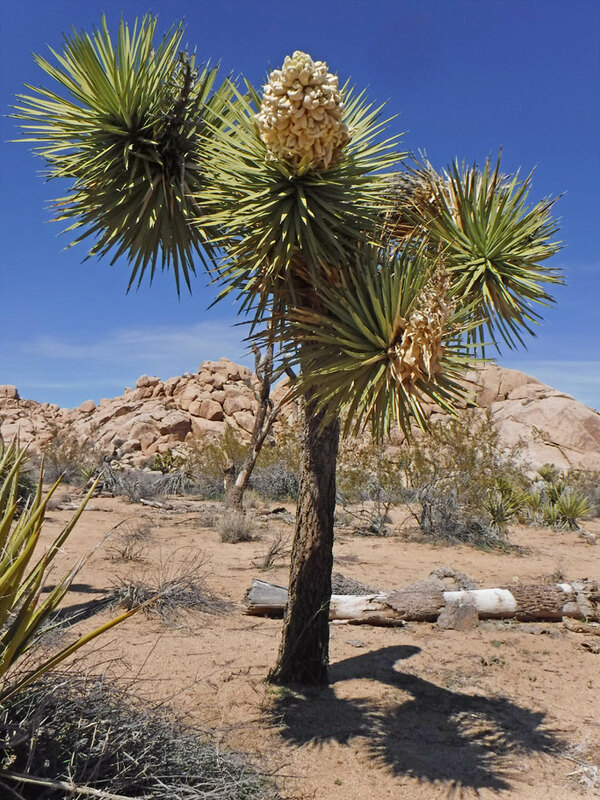 Yeah – some of Joshua Tree doesn’t actually have Joshua Trees in it. Your visit must have been a while back – the park is very well developed and organized now. Love the history and beauty! The photos are stunning. Thanks Jo! We had a good time there and had some amazing hikes.